The “Big Kahunas” award of 2015 goes to Platte River Networks, the Denver-based IT and networking company that hosted the server of former Secretary of State Hillary Clinton. The company now at the forefront of Hillary’s email scandal recently billed the presidential wannabe for legal and public relations expenses they have incurred since the FBI and hordes of angry reporters darkened its doorstep asking a lot of questions. That’s according to Todd Shepherd, who obtained and posted the Sept. 16 invoice on Complete Colorado. The bill amounts to $44,000 – that’s about $25,000 for legal fees and $19,000 for public relations. 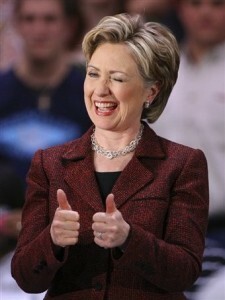 We may not know if she’s paid the bill, but the existence of the invoice strongly suggests that her people were involved in trying to spin the controversy that the Secretary of State used a private, non-government server, and possibly worse, they tried to cover up messages still contained on the cloud that we now know exist. Maybe we’ll find out Thursday when Hillary goes to Capitol Hill to explain her role in the Benghazi attack as well as her use of a private email account.